Martinez is the country’s first Latina governor and the first female governor of New Mexico. Apparently, Donald Trump doesn’t realize Governor Martinez wasn’t elected in 2000, that she has fought for welfare reform, and has strongly opposed the President’s Syrian refugee plan. But the pot shots weren’t about policy, they were about politics. 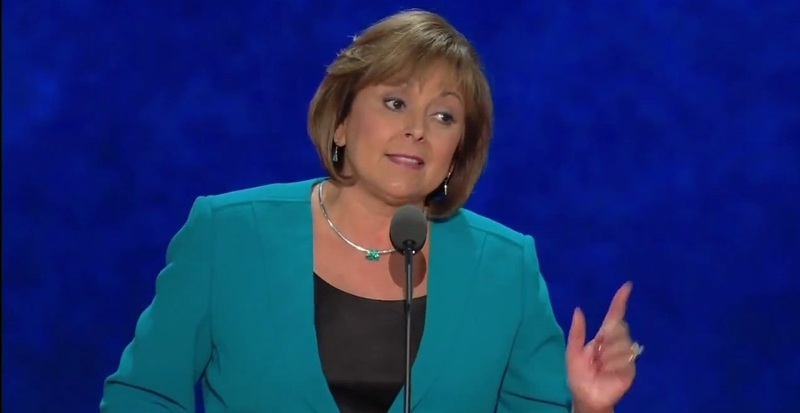 And the Governor will not be bullied into supporting a candidate … Governor Martinez doesn’t care about what Donald Trump says about her – she cares about what he says he will do to help New Mexicans. She didn’t hear anything about that today. …James Hohmann at the Washington Post takes it seven steps farther listing and discussing “seven reasons why last night’s comments are deeply problematic…” and in doing so in effect presents seven reasons why this demagogue’s candidacy itself is problematic and, in addition and in my opinion, why this clown is so deeply flawed in so many ways. 1. The riff underscored the hollowness of Trump’s promises to unite the fractured Republican Party. 2. Attacking the most prominent Latina in his party will make Hispanic outreach even harder. 3. Last night’s rally further illustrates why Trump is on track to get clobbered among women. 7. As Trump snipes at fellow Republicans, he continues to galvanize the left. Martinez is not just Hispanic; she’s also the first female governor of New Mexico. Tellingly, she was not the only target of Trump’s ire. Several other women were in his crosshairs, as well, and his language was quite gendered. Finally, and most ironically, New Mexico Governor Susana Martinez was suggested by none other than Fox News “stalwart and Trump’s vanilla milkshake partner in crime,” Bill O’Reilly, as the “only choice” for Trump’s running mate. Apparently these rare words of possible wisdom by O’Reilly could not get through the Don’s coiffure and into his ears.